Last Sunday I shared the following image on YTC Facebook and Twitter. It's such a beautiful example of the benefits of journaling, I just had to expand upon this in a newsletter article. The markets don't always back up the very next day with a repeat of key price sequences. The real benefit builds over time. As you populate your journal with more and more examples of key price action sequences (and ensure regular reviews) you will come to see repeated patterns or themes within the data. 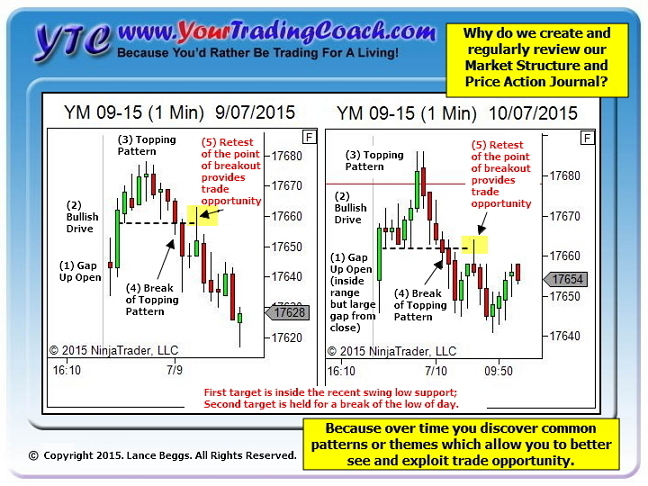 Some of these patterns or themes lead to documented improvements to your trading plan. But most are simply internalised, improving your situational awareness as real-time data unfolds in future trading sessions. You have improved your ability to perceive shifts in the supply/demand dynamics of the market. You have improved your ability to understand what that shift means in terms of risk and opportunity in the near future. And you have improved your ability to exploit that opportunity for profits (or minor losses when wrong). Similar benefits apply when journaling market structure features, in particular the points of transition from one environment to another. It's a great question. If there is no benefit to be gained then the time spent journaling would be better spent elsewhere with other activities which do promote our learning and development. For me though… I see great benefit. Having some expectations for the likely day-type can help in adjusting your trade management style to better suit the environment. If you know that a day after trend day is likely to be a rangebound session (at least initially, until proven otherwise) then you’ll lean more towards taking profit at targets rather than holding any of the position for potential runner. 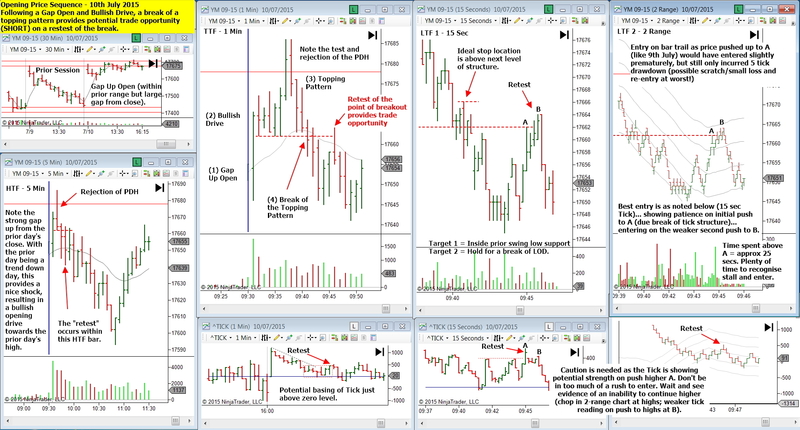 Another example: If you know, through having built up a comprehensive market structure journal, that a break from a double inside day has the potential to be a strong trend day, then you’ll again adjust your trade management style accordingly. You’ll perhaps be more willing to hold a position open through any short-term retracement, in expectation that the trend has a higher probability of continuing. You won’t always have a clear expectation for the type of day that will follow. But when you do it can help improve the quality of your decision making. If the nature of your trade decision making never adapts to any environmental changes, then you’ll have no need for this at all. But I don’t know any discretionary price action traders who operate in such a manner. We place 'market structure' entries within our journal because they help us learn to identify and adapt to changing market conditions. Knowing when to sit aside and wait for something better. Knowing whether to trade aggressively or conservatively. We, if we wish to be effective in trading these markets, need a similar ability to adapt to the changing market conditions. 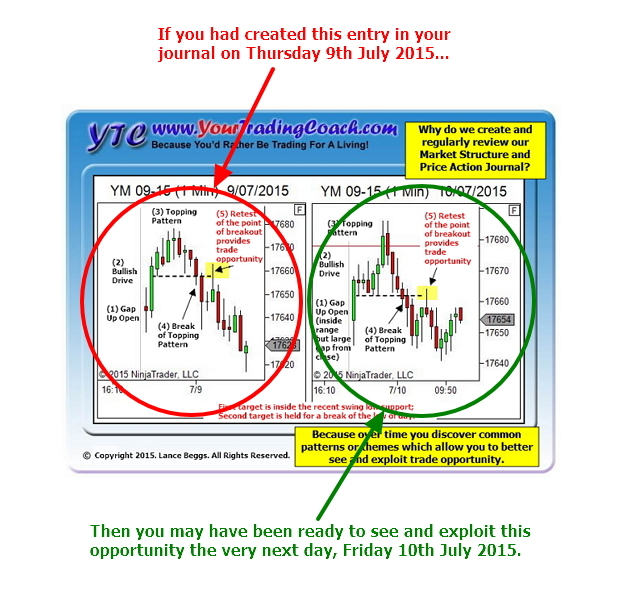 I often come across traders who are not creating and using a Market Structure & Price Action Journal. 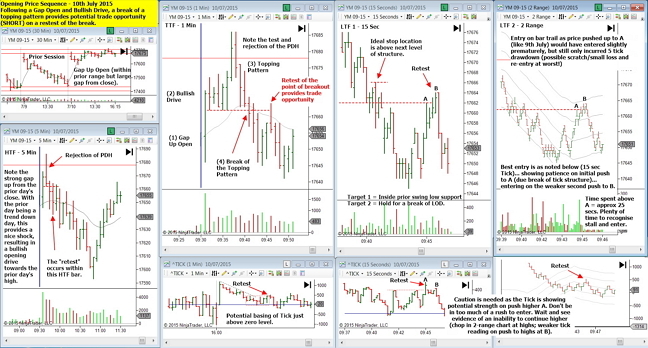 And yet, in my opinion, it's the greatest tool I've ever come across for improving your ability to read, recognise and respond to price movement and structural and environmental change within the market. If you haven't got started yet, do it now. Here are the first two entries for your journal, just to give you a head start. Click on the following images, or the links which follow, to get a full-page examination of the two price sequences which formed the social media post shown above. File them in your first section, "Study of opening price sequences." 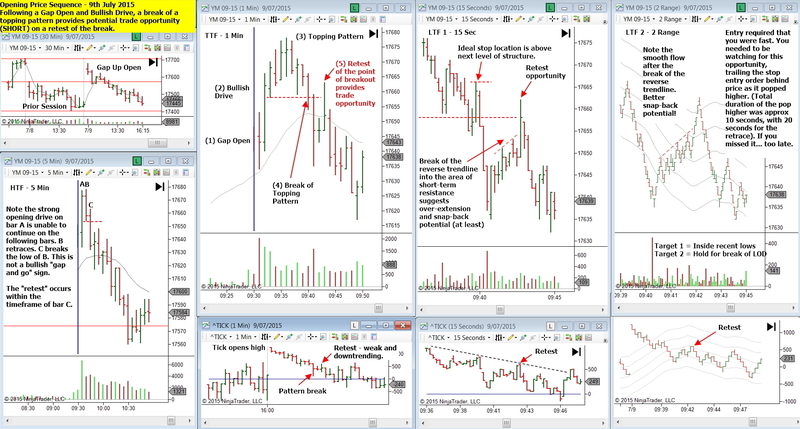 Now… add additional entries from future trading sessions. also, please mr Beggs could you include minute by minute increments on the x axis? No problem Sir. I suspect my request will have illumiated aspects of my approach to those without blinkers. Again ty for your articles! The images are very useful Lance. I printed them off and used them in my journal. They also reminded me of the value of the journal and motivated me to devote more energy into working on it. Thanks for what you do!!! Good luck with creation of your journal.